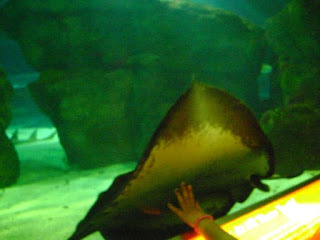 We went to the aquarium at the Mall of America on my daughter's 15th birthday. We were practically underwater together - my partner, daughter, sister-in-law, nephews and I - encountering turtles, sharks, stingrays, and all kinds of fish. Fish with whiskers, fish with purple spots, fish that were calligraphy, silky bumpy fish. I had a raging headache from the mall, but it was dulled by all the water. The hand above is not my daughter's, but it captures our encounter - touching life just on the other side of glass.